I keep learning about new ones and I'd love to have a list I could easily refer to. These are the same as with Rails 3. They are stored as strings if you run your app with a not-PostgreSQL database. 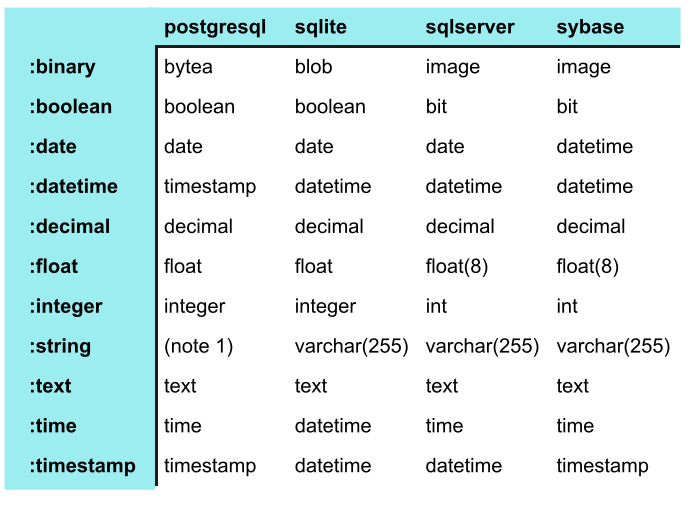 There's a lot more postgres specific datatypes in Rails 4 and even more in Rails 5.
:binary - is for storing data such as images, audio, or movies. :boolean - is for storing true or false values. :datetime - store the date and time into a column. :decimal - is for decimals (example of how to use decimals). :integer - is for whole numbers. There's also references used to create associations. But, I'm not sure this is an actual data type. Learn more about the address datatypes here and here. 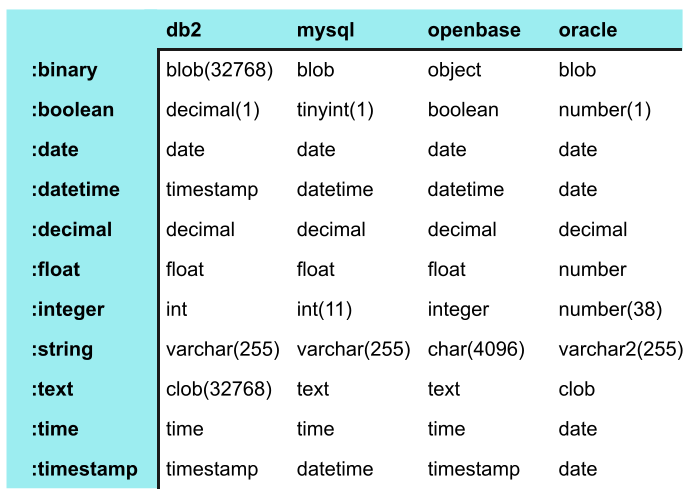 Rails4 has some added datatypes for Postgres. Rails 4 has support for native datatypes in Postgres and we’ll show two of these here, although a lot more are supported: array and hstore. We can store arrays in a string-type column and specify the type for hstore. Not the answer you're looking for? Browse other questions tagged ruby-on-rails ruby ruby-on-rails-4 rails-activerecord or ask your own question. How to store decimal values in SQL Server? Where is the documentation page for ActiveRecord data types? What is the difference between the Rails datatypes? Is there documentation for the Rails column types?